Creating healthy oral health habits for your child starts at a very early age. The sooner your child sees a pediatric dentist, the sooner those great healthy habits start. There are a number of reasons for the AAPD’s and AAP’s recommendation for your child to visit the dentist earlier than you think. Some parents are under the misconception that baby teeth aren’t that important, as they ultimately fall out anyway. However, baby teeth are important and knowing how to deal with them, especially as they become loose, will ease the burden of the little ones losing their baby teeth. Many kids are excited about losing a baby tooth because a lost tooth means the tooth fairy will leave a surprise under their pillow. However, other children might be anxious about the process of losing teeth. If that’s the case, it may be a good idea to visit your pediatric dentist to explain what it means to lose baby teeth, and how exciting it will be to grow in strong, healthy adult teeth. Parents could also use some guidance when it comes to wiggly teeth, such as whether they should be pulled or not. Getting an early start by visiting a pediatric dentist, who can explain the whole process, can really help parents who are confused about what to do and all the conflicting information out there. Pediatric dentistry experts recommend that children have their first dental exam by the time they reach their 1st birthday, or as soon as the child’s first tooth erupts. Surprised at how soon that sounds? Don’t be! The sooner you start your child on regular dental visits, the sooner they become accustom to the event, and their fears will decline greatly (if they have any). 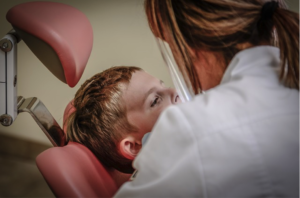 Pediatric dentists are well-versed on easing your child’s fear of going to the dentist and can provide great tips such a games to help get your child ready for their dental visit each time to make the experience a bit more pleasant, so it’s a great one that they talk about in the car ride home! The sooner a dentist can see your child’s teeth and how they’re developing, the better baseline they’ll have as the teeth continue to form, erupt, and ultimately fall out and permanent teeth come in. They can also spot any early indication of baby bottle tooth decay, often caused by the frequent and long-term exposure of a child’s teeth to liquids containing sugars. They can suggest tips on how to avoid it from happening, and address the issue if it’s already occurring. When you’re a new parent, the learning curve for child care is steep! A pediatric dentist can provide tips on how to keep your child’s teeth and gums healthy, starting at a very early age. They can provide information on choosing the right toothbrush, the best healthy snacks for children’s teeth, how old a child should be before they can brush on their own, and so much more. They are a fantastic resource for pediatric tips and helpful hints and can save a parent time and stress by giving them guidelines on good oral health at a very early age. Make sure your child starts a lifetime of good oral health habits by getting them to a pediatric dentist at a very young age. It will go a long way to ensuring they have healthy smiles for years to come.